Disney’s Alice in Wonderland is solid entertainment for kids, although it’s flawed as an adaptation of Lewis Carroll’s classic books. For fans of the movie and their children, the video is worth a look. The 60th anniversary Blu-ray/DVD combo pack has some of the better features from earlier DVD releases and adds a few new ones that should appeal to anyone familiar with the books. 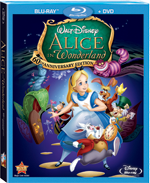 The story begins with Alice (voiced by Kathryn Beaumont) daydreaming in the countryside, when she spies a white rabbit with a waistcoat and watch, and follows him down very deep hole. From there, Alice changes size several times, and meets the psychotic Queen of Hearts, the Cheshire cat and many other odd creatures. Alice doesn’t quite capture the surreal and sometimes dark spirit of the books. It does have some good moments, as when Alice meets the odd creatures of Tulgey Wood, including mome raths. But more often, the movie reverts to Disney cuteness, as in the garden of the talking flowers. It would be impossible to expect Disney animators to cram both Alice’s Adventures in Wonderland and Through the Looking-Glass and What Alice Found There into a 75-minute movie. That the studio spent more than a decade developing this movie seems to indicate that the filmmakers had a hard time deciding which parts to include. Aficionados of the books may find the result to be too sanitized and jumbled, but kids should enjoy the adventure. The most interesting new feature on the Blu-ray is Through the Keyhole: A Companion’s Guide to Wonderland, which functions like a commentary track. It has talking-head interviews with animation historians, Lewis Carroll experts and Disney artists while the movie in its entirety plays as a picture-in-picture. They provide plenty of information about the making of the film, the books, and also about the life of Carroll and the real Alice. Kathryn Beaumont introduces Reference Footage: Alice and the Doorknob (1:33). Beaumont and others acted out certain scenes to give animators a visual reference — a technique that was used frequently by the Disney animation studio. This little snippet can be watched with Beaumont’s commentary. Watching it without commentary brings up a picture-in-picture of the actual movie for comparison. Pencil Test: Alice Shrinks (1 minute) is a sequence of rough pencil animation; it’s also introduced by Beaumont. The Painting the Roses Red game is faster-paced and more complex than the games on Disney’s earlier DVD releases. Though the instructions are simple and clear, I had trouble getting it to work. I suspect my remote is to blame and not the disc. Some of the better extras from earlier DVD releases are also on the Blu-ray in the Classic DVD Extras section. Disney seems to have a short film to fit just about any theme, and there are two on this Blu-ray: Thru the Mirror (8:49), a Mickey Mouse short from 1936 and Alice’s Wonderland (8:06), a 1923 silent film. If you haven’t learned enough about the movie from Through the Keyhole, Operation Wonderland (11:08) and Reflections on Alice (13:26) fill in the gaps. There are several featurettes about deleted materials, and six demo recordings of songs that were never used. There is also a gallery of concept art with easy-to-use interfaces. The rest of the extras are more promotional in nature. For a glimpse into the early days of television, there is a 30-minute excerpt from The Fred Waring Show, from 1951, in which actors, some of whom supplied the movie’s voices, act out scenes from the books. Disney’s first television show, One Hour in Wonderland, is shown in its entirety. Finally, there are two theatrical trailers. All of the extras on the DVD have been on earlier releases. A game called Adventures in Wonderland is probably too simple for anyone over age seven. Virtual Wonderland Party has costumed actors and kids at a tea party a la Barney. The rest of the features are also on the Blu-ray. Reflections on Alice and Thru the Mirror are here, as are two of the deleted materials featurettes. Pig and Pepper (3:12) never made it past the storyboard stage. Disney veterans Ron Clements and John Musker introduce and entertainingly narrate this series of sketches. I’m Odd (3:56) is a song that was to be sung by the Cheshire Cat. The movie is presented in its original 1.33:1 aspect ratio. The Blu-ray has the Disney View option, which fills in the gaps on widescreen televisions with artwork that is meant to extend the image. Some viewers might find this less distracting than the black bars, but it didn’t improve my viewing experience. This option isn’t available on the DVD. The picture quality on both discs was outstanding. On the Blu-ray, English-speakers have the option of Disney’s Enhanced Home Theater Mix or DTS HD 5.1. Both soundtracks are very good, with the surround sound more noticeable on the HD option. The DVD has Dolby Digital 5.1 soundtrack and the original theatrical mono soundtrack. Both discs have French and Spanish soundtracks as well as subtitles in English, French and Spanish. Watch the movie. Just for fun, watch Mickey Mouse in Thru the Mirror. The next time you fire up the Blu-ray player, check out Through the Keyhole. There is a great deal of material on the Blu-ray and it’s mostly geared toward people with an interest the movie’s back story. If you just want to watch the movie, and you’re not planning to buy a Blu-ray player, you’ll probably be just as happy with the earlier DVD releases of the movie.